Graduate student Zach Petrek at NASA's Ames Research Center. Zach Petrek, a second-year doctoral student in chemistry and chemical biology, can usually be found running experiments in the laboratory of his advisor, Professor Tao Ye. But this summer, he did something different — he went to NASA. 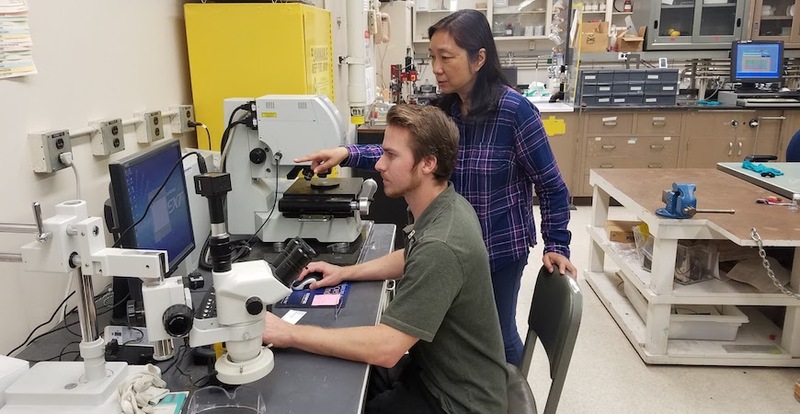 Petrek was one of seven UC Merced students to intern at NASA over the summer, an opportunity provided through MACES, the Merced nAnomaterials Center for Energy and Sensing. Launched in August 2015 with substantial NASA support, MACES has a mission that encompasses cutting-edge research, community outreach, and training students for tomorrow’s NASA careers. As part of its mission, MACES provides students with a direct pipeline to NASA internships. Petrek interned at NASA Ames Research Center in the lab of Jing Li, where he worked on developing chemical nanosensors to detect proteins and DNA. According to Petrek, comparable nanosensors that detect biomolecules in gas have been around for 10 years. It was Petrek’s job to make the technology work in different contexts. Though his research aims were clear, Petrek was given significant leeway to pursue the project on his own terms. Outside the lab, Petrek attended the NASA Ames 2017 Summer Series, biweekly seminars that brought scientists and engineers to Ames to discuss topics as wide-ranging as planetary science, aerospace engineering and astrobiology. Petrek (seated) working with NASA scientist Jing Li, who mentored Petrek during his NASA internship. 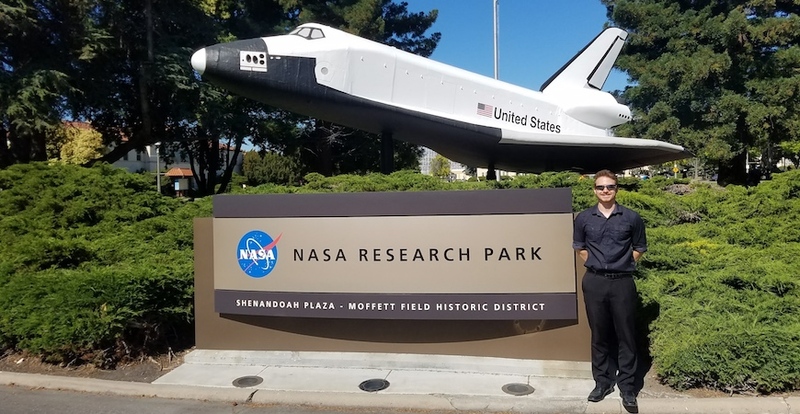 While Petrek stayed in California for his internship, Jose Partida traveled to Ohio to work at Glenn Research Center under NASA Senior Technologist Christopher DellaCorte. Partida, a fifth-year mechanical engineering major, started working with DellaCorte as part of a joint research effort between NASA and Professor Ashlie Martini. When Martini assigned Partida to a project in collaboration with DellaCorte’s lab — in the field of tribology, the study of friction and lubricants — Partida’s efforts impressed the NASA scientist. 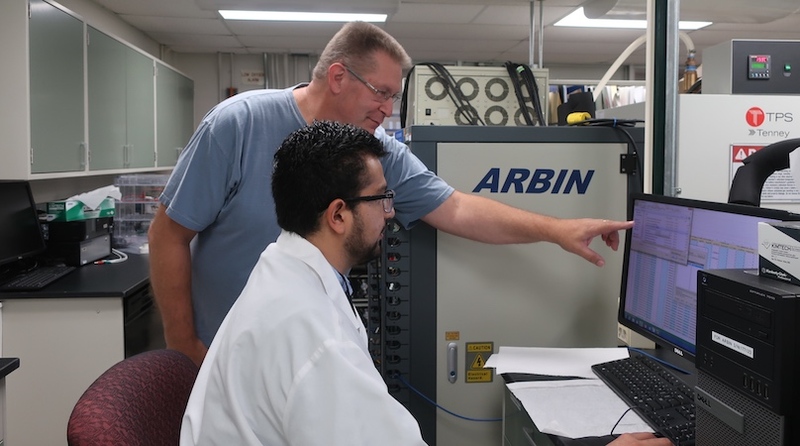 At Glenn, Partida helped characterize solid lubricants for a project related to NASA’s Orion Spacecraft. Though the work was largely proprietary, Partida was candid about how the internship influenced his post-graduation plans. Carlos Ortuño, a second-year graduate student advised by MACES Director Jennifer Lu, also spent the summer at Glenn. Working under NASA scientists James Wu and Dionne Hernandez-Lugo, Ortuño characterized lithium-sulfur and lithium-CO2 batteries that will power equipment on future missions to Mars and Venus. Graduate student Carlos Ortuño (seated) works with NASA scientist at Glenn Research Center to characterize lithium-sulfur batteries. Elsewhere, Victoria Arias and James Rosenberg, both undergraduate researchers in Lu’s Lab, spent the summer at NASA’s Langley Research Center. Arias used experimental and computational methods to study the effects of radiation on materials, structures and people in extraterrestrial environments. Rosenberg, meanwhile, worked on developing boron nitride nanostructures that may one day protect spacecraft from thermal stress when landing on Mars. For their efforts, Arias and Rosenberg received the Exceptional Contribution Award from the Advanced Materials and Processing Branch at Langley. And for Arias, the NASA experience has yet to end. Arias plans to extend her Langley stay through the academic year, returning to UC Merced next fall to complete her degree. For Petrek, who credits MACES and the prospect of a NASA internship as a major factor in deciding to attend UC Merced, the internship fulfilled a lifelong ambition. As for the future of the internship program, MACES plans to send nine students to NASA in summer 2018. “It’s a stellar opportunity for UC Merced students to fulfill their own lifelong ambitions,” Lu said.